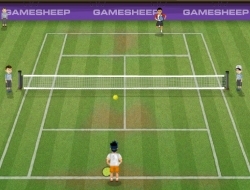 This is a great sport game in which you can test your tennis abilities in this tournament. You will play with some of the biggest names in the world when it comes to field tennis and they will not go easy on you. Try to serve the ball with perfect timing and sometimes you may score an ace if the opponent cant react fast enough to hit the ball back. Position yourself well in your half of the field so you can cover all of it in a short time. Try to anticipate what the opponent will do and then rush in and attack if you feel that you can catch him off guard. Try to reach the finals and then win one last match to take the trophy and win the prize check. Have fun smashing the tennis ball with your racquet but always be a fair player. Use the mouse to move and hit the ball. Tennis Champions 0.00 between 0 and 10 based on 0 votes.